Sketchfab is a community for users to publish, share, and discover 3D models on a web-based platform. Character Creator 2.0 Beta allows you to directly upload to Sketchfab, making it painlessly easy to share your 3D artwork with the world. 3. 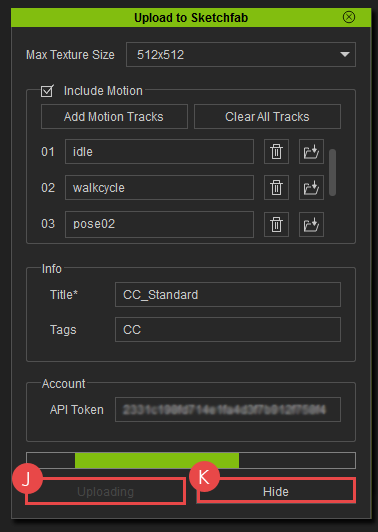 In the Password & API section, copy the serial number for your API Token. Click the icon from the toolbar to expand the window of "Upload to Sketchfab". Select the desired texture resolution. Note: If you are a Basic member, we recommend using 512x512, anything larger may surpass your 50 mb upload limit. Check to enable the inclusion of iMotions. This button will open a browser for selecting iMotion files. 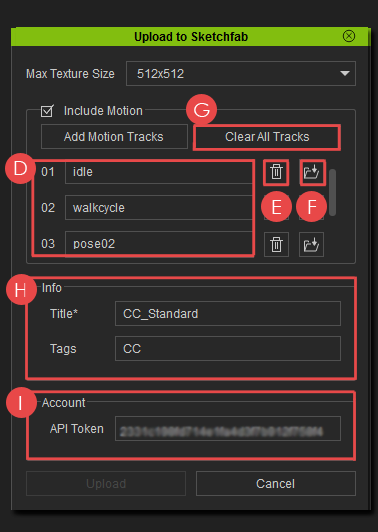 Here you can inspect the added motions and change the name of each motion if necessary. Note: Files with the same names can be added, if one accidentally added a file of the same origin then a warning message will appear. Use this to remove individual motion clips. Use this to replace the current motion clip. Use this to wipe the entire list of loaded motion clips. Here you can give the Sketchfab file a title and description tags. Note: Add a space multiple tag entries. 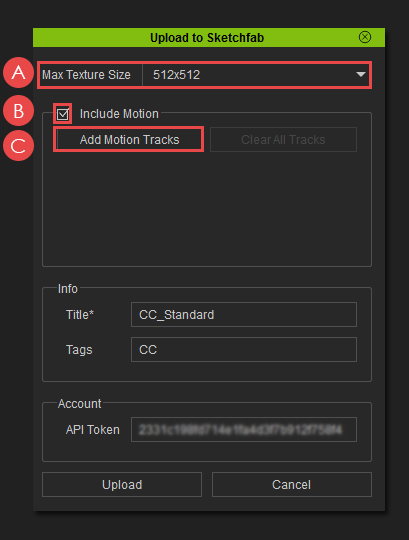 Past the Sketchfab API Token here copied from the previous section. Note: the API Token will be remembered by future sessions of Character Creator. Once the parameters are set for the uploader and the file has been committed for sending, CC will prompt you to save a copy of your file. Once decided, the uploader will proceed to package the files and transmit it to Sketchfab (internet connection required). The packaging and online transmission is in progress when the Upload button is greyed out and changes its title to Uploading. Use this to hide the UI while the uploader is packaging and transmitting. The uploader is done when a message pops up alerting so. Now you may view the results on the Sketchfab website. Note: freshly uploaded Sketchfab files are set to Private. You can make sure the file is okay then set it to Public at your discretion.